Open world games keep getting bigger and bigger, but the time we have to thoroughly explore them is limited. Most players will never see all the beautiful things a game has to offer, but a time-lapse walkabout across the entire map can offer a slightly blurry glimpse. As spotted by Eurogamer, Gaming YouTuber Enigma recently started uploading videos of timelapse walks through big gaming worlds. 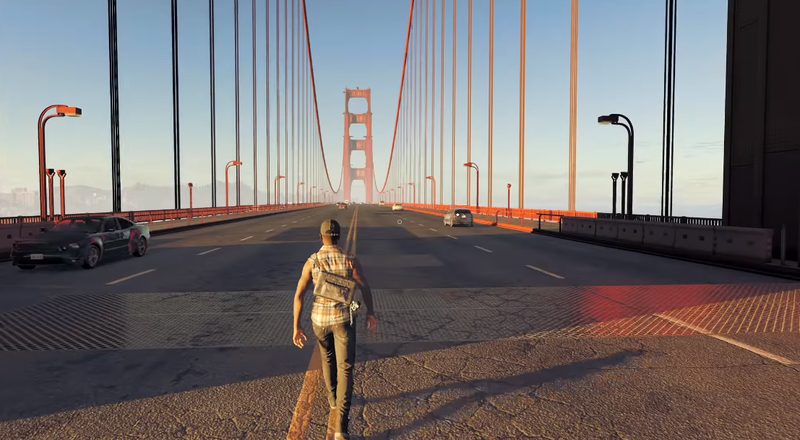 The newest takes viewers on a tour of virtual San Francisco from 2016’s Watch Dogs 2’s. They start at the northern edge of the Golden Gate Bridge before making their way down into the heart of San Francisco. They head further south into the game’s version of Silicon Valley before crossing the San Mateo Bridge to get into Oakland. One moment it’s bright blue skies over the bay. In the next, San Francisco is lit up at night. Enigma commented under the video that the trip ended up taking two hours and 20 minutes to complete, but the time-lapsed video is able to show the journey in just under four minutes. It helps that Watch Dogs 2’s map is very circular, allowing Enigma to hit all of the main locations without having to backtrack or hop into a boat. It also shows off the beauty of Ubisoft’s open world while in motion. Much of Enigma’s walkabout takes place on highly trafficked roads, and it’s cool to see them waltz through these areas as the AI-controlled vehicles gracefully glide past or quickly stop to avoid hitting the player. In the past couple weeks, Enigma has posted other time-lapsed escapades through sprawling video game worlds, like last year’s Red Dead Redemption 2. Unlike Watch Dogs 2, or the recent Grand Theft Auto games, which Enigma has also explored this way, the RDR 2 video offers a sped-up hike through naturalistic landscapes of 19th century America. Instead of a flood of cars or people passing by, it’s the thick, fluffy clouds constantly morphing as they roll across the horizon that steal the show. Enigma’s journey eventually ends in a snowy blizzard up north, with the time-lapse able to show off not just how sweeping RDR 2’s world is but how it transforms as the weather and sunlight change. The videos are certainly no replacement for digging into these games first-hand but condensing their scope into a few minutes of footage makes it easier to appreciate just how vast and diverse their worlds can be.